The Journal is our print magazine published two times per year. The Journal continues the tradition of giving many more members and others an opportunity to share their special skills and talents with the full membership by writing magazine type articles. Printing is of high quality with a glossy cover. Our current publication schedule is 56 pages each in the spring and fall. Well known authors have included: Garrett Hack, Mike Dunbar, David Lamb, Allan Breed, Jon Siegel, Terry Moore, Ted Blachly, Brian Sargent, Jeffery Cooper, Bill Thomas, Greg Brown, Gary Armstrong, Tom McLaughlin, Marty Milkovits, Claude Dupuis, Kari Hultman and many others. 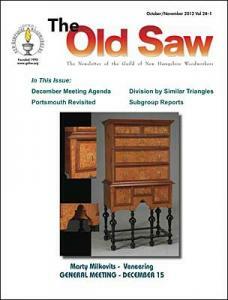 The Old Saw was a printed and mailed newsletter. It became a download-only publication beginning in 2009. 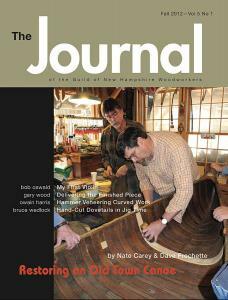 Content consisted of Guild news plus feature articles from prominent woodworkers. This feature content was moved to The Journal in 2009. Prior to 2009, this was our only means of communicating with the membership. However, although The Old Saw continued for several more years, Guild news was gradually delivered by a weekly email newsletter—TouchUps. Archives through 2015 are avaliable here. Archive of individual articles for 2015–2016 are available here.